This cafe provides “universal toilet seat covers” in the restroom. I find that optimistic, at best. 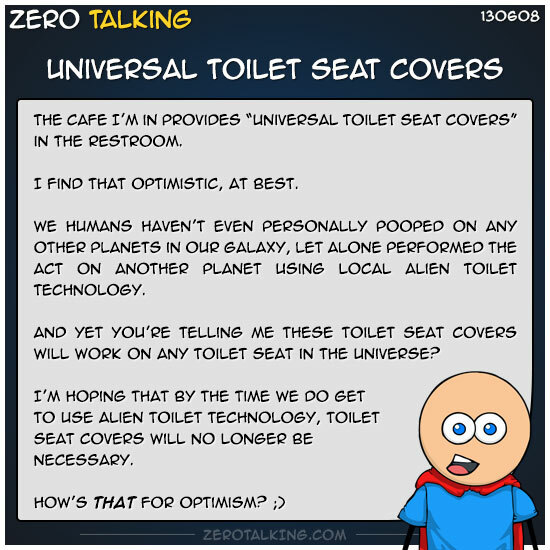 We humans haven’t even personally pooped on any other planets in our galaxy, let alone performed the act on another planet using local alien toilet technology. And yet you’re telling me these toilet seat covers will work on any toilet seat in the universe? I’m hoping that by the time we do get to use alien toilet technology, toilet seat covers will no longer be necessary.